My dream was to go out into the real world and bring about school improvement at a level that would impact national thinking, practice, and policy. … We began with two of the lowest achieving, most troublesome elementary schools in the city. The usual focus at the time was on the students. But from my own experience, and my public health and child psychiatry background, I knew that we had to focus on the system and the child … not just the child. Comer was then a young child psychiatrist at the Yale Child Study Center in New Haven, where he had just launched the School Development Program (SDP). Baldwin and King elementary schools, where Comer began his work, were among the lowest achieving of New Haven's 31 public schools. More than 50 percent of the students were on government assistance, students were chronically truant, student behavior was disruptive, and morale among the staff was low. A few years later, however, the picture was very different. The schools had become peaceful, purposeful, and happy environments for children, welcoming to parents, and supportive of staff. A later analysis of achievement in the two New Haven pioneer schools found that between 1969 and 1984, 4th grade students' grade equivalent scores increased from about 3rd grade level in reading and math to 6th grade level in reading and 5th grade level in math. By 1984, these schools were two of the highest-performing schools in New Haven and had near-perfect attendance (Comer, 1988). Although many rounds of school reform have come and gone in the 50 years since this work began, the School Development Program has withstood the test of time, quietly revolutionizing the purpose and organization of some of the most troubled schools in the United States, empowering teachers and parents as decision makers; fostering healthy development of students; and producing noteworthy outcomes for student behavior, positive attachment to school and adults, and achievement. The SDP builds on the science of child development, creating a whole child framework for reform that takes a systems approach toward reorganizing the school. It aims to ensure that all members of the school community—students, teachers, principals, parents, support providers—are knowledgeable about child development and supported in working together as interdependent, valued, and respected partners, simultaneously empowered to make decisions together for the express beneﬁt of every child. The School Development Program builds on and conveys shared professional knowledge about how children and adults develop and learn that should, in an ideal world, be readily available to every educator. It is not a cookie-cutter program, but rather a means for enabling educators and schools to support social, emotional, cognitive, and physical development for children—a foundational approach that research has found is critically important for success in both school and life (Cantor, Osher, Berg, Steyer, & Rose, 2018; Osher, Cantor, Berg, Steyer, & Rose, 2018). This whole child approach has been difficult for many schools to engage in during the era of test-based accountability ushered in by the No Child Left Behind Act (NCLB), when U.S. education policies focused intently on raising student test scores, often to the exclusion of other goals, such as student health and welfare; physical, social, emotional, and psychological development; critical and creative thinking; and communication and collaboration abilities. Only 29 percent of the students felt their school provided a caring, encouraging environment. Fewer than half of the students reported they had social competencies such as empathy, decision-making skills, and conﬂict-resolution skills (from 29 percent to 45 percent, depending on the competency). These conditions contribute to school failure and high dropout rates. Research shows that narrowly conceived, standardized, and punitive approaches to instruction and student treatment undermine student motivation and learning and facilitate student disengagement from school. Almost three-quarters of a million students in the United States—disproportionately students of color, those with disabilities, and those from low-income families—do not complete high school each year, costing society hundreds of thousands of dollars per student over the course of their lifetimes (Rumberger, 2012). The costs of this disengagement and the subsequent exclusion of students from educational opportunity are devastating and lasting for individuals and for society as a whole. Yet we know a great deal about how to support students and enable success by attending to their development in ways that foster relationships and promote learning. At a time when the education world is seeking to recalibrate after the No Child Left Behind era, it is appropriate to refocus on how this kind of knowledge can be planted and nurtured in schools. This book offers an account of one well-vetted way to support the development of whole child education in the context of whole school reform. We connect this work to the emerging science of learning and development and the implications for practice of building schools in alignment with how children develop and learn. The School Development Program, also known as the Comer Model or Comer Process, was established in 1968 in two struggling elementary schools as a collaborative effort between the Yale Child Study Center and New Haven Public Schools. Since then, the SDP has been implemented in more than 1,000 schools in 26 states in the United States, the District of Columbia, Trinidad and Tobago, South Africa, England, and Ireland (see the Comer School Program website). Why was I able, and why were my brothers and sisters and others who came from similar backgrounds able, to succeed in school and have opportunities when I had friends who were just as able but went downhill? They had different developmental experiences. Systems were created to pass on the [false] belief that our abilities are largely genetically determined. All the scientiﬁc evidence that has accumulated gets ignored because we keep focusing on curriculum, instruction, assessment. The education enterprise focuses on it, the public believes it, and practice conﬁrms it—what you end up doing is showing that kids who are prepared for school receive support for development and do well, and those who are not, don't do well. Comer emphasizes that if children are not doing well in school, or if they are behaving in ways that are counterproductive, adults must understand that the child is not trying to be "bad" but is exhibiting a need for attention—often related to deeper concerns that need to be surfaced and understood—or a need for explicit teaching about how to behave productively in the classroom context. When adults assume that children are deliberately misbehaving and jump to punishing the behavior rather than seeking to understand it and model alternatives, students fail to learn how to build a repertoire for problem solving. Furthermore, they can adopt an oppositional stance to the teacher and the school. In schools that are underperforming, where students and adults are often trapped in a vicious cycle of frustration, isolation, and helplessness, Comer's process for school reform trains educators, in partnership with parents, to take speciﬁc, developmentally sound steps toward holistic school change that creates a productive context for each child's development. The goal is for all educators to use the principles of child and adolescent development to create positive interactions between students and school staff members, and ultimately to transform school culture by also drawing on family and community resources (Cook, Murphy, & Hunt, 2000). The School Development Program focuses on six developmental pathways—cognitive, social, psychological, physical, linguistic, and ethical—as a foundation for successful learning and healthy development (see Figure 1.1). Educators and parents are provided with a framework that helps them support the healthy development of children along all six pathways by engaging in a coordinated set of student-support processes and by using three guiding principles for their own work: collaboration, consensus, and no-fault problem solving. With an approach to teaching, learning, and classroom and school management that is student-centered and developmentally appropriate, the program emphasizes the importance of reﬂection by both children and adults to promote better thinking, better management of feelings, and more desirable social behavior. Source: From Yale Child Study Center, School Development Program. Copyright 2008 by Yale Child Study Center. Reprinted with permission. In schools using the Comer Process, far more is expected from students than just cognitive development. Children's development is multifaceted, and children need support in developing their full repertoire of skills. As described in Six Pathways to Healthy Child Development and Academic Success (Comer, Joyner, & Ben-Avie, 2004), educators play a role in supporting children's development along multiple pathways. Promoting the physical development of children and adolescents encompasses physical health, nutrition, and responsible decision making, especially regarding adolescent sexual conduct and use of drugs and alcohol. The cognitive pathway involves helping children and adolescents increase their capacity to think for themselves, to plan strategically and effectively, to solve problems in different contexts, to set goals for themselves, and to work with focused attention to accomplish those goals. This pathway also includes recognizing when one's own resources are not sufficient to carry out a task and when to ask for and receive help. A focus on the psychological pathway includes training children and adolescents to manage their emotions in socially acceptable ways and increasing their capacity for self-acceptance and self-conﬁdence during the ongoing process of identity formation. Establishing a safe classroom climate is essential for students to grow in conﬁdence and feel they can take risks and learn. Language is a part of everything that occurs within the school. Communication skills—listening and speaking, reading and writing—are essential for students to become successful and productive in our diverse society. To ensure mastery of language, teachers must deliberately teach and model language and communication skills, for children do not all come into the classroom with the same exposure or experience with language. Promoting development along the social pathway involves developing children's and adolescents' capacity to build healthy relationships, to interact with individuals from diverse backgrounds, and to demonstrate empathy toward others. The ethical pathway is concerned with helping children and adolescents to develop the capacity for acting with justice and fairness toward themselves and others, including showing respect and having integrity. Encouraging students' involvement in designing the classroom codes for verbal and nonverbal behavior provides them with an opportunity to apply the ethical pathway to their everyday experience. Across all of these pathways, students beneﬁt from having adult role models. This framework helps educators and parents better understand their children and themselves, and it is used to address student, adult, and community issues. To promote children's academic success, the two most important objectives are developing a comprehensive understanding of what needs to be done in the best interests of every child, and then making the deliberate effort to meet the needs of every child effectively (Comer et al., 2004). The developmental pathways framework can be used as part of the process of student planning, to understand developmental issues that children are experiencing using a whole child lens. For example, a child may sleep in class for reasons that are physical (lack of sleep), cognitive (boredom with the task), or psychological (to disguise feelings of inadequacy). The pathways approach encourages considering multiple causes and generating solutions without blame to address the needs of each child holistically. It can also be applied to curriculum, instruction, and classroom management. Teachers can categorize what they are doing according to the pathways to identify ways that they are supporting students' development along each pathway and brainstorm ways that they can augment support for any pathways as needed. Teachers can also use the pathways to assess their own well-being and interactions with students (Comer et al., 2004). The pathways framework is also a guide for schools to assess programs that are being considered for implementation. For example, the School Planning and Management Team, which is part of the SDP structure, might examine a program by creating a grid that looks at the populations served and the pathways addressed to make sure the program is truly meeting the needs of students and addresses most, if not all, of the six pathways. Educating parents about the six pathways allows parents to understand their children more fully and to learn the beneﬁts of interacting with them from a perspective of whole child development. The pathways framework provides teachers, students, and parents with a common language. A child-focused developmental perspective extends the principle of no-fault problem solving to relationships with children; provides a framework for adults to consider children's behavior in a larger context, offering a broader view of each child; and enables adults to develop and implement strategies to promote students' health and positive self-esteem. The goal is for educators to become facilitators of opportunities for success, so that students ultimately have good reason to see themselves as successful. The SDP framework helps redesign school operations based on guiding principles that promote respect. Using the metaphor of a schoolhouse, Figure 1.2 shows how the various elements of the SDP work together. Strong relationships supporting child/adolescent growth along the six developmental pathways are the foundation of this schoolhouse, from which a supportive school can emerge in an atmosphere of collegiality, with a deep understanding of how children learn and develop. Source: From Yale Child Study Center, School Development Program. Copyright 1998 by Yale Child Study Center. Adapted with permission. Three operations guide the work happening in classrooms, hallways, offices, and the cafeteria: (1) the Comprehensive School Plan, which includes social and academic components; (2) staff development; and (3) a process of assessment regarding what's working and what needs modiﬁcation in the course of continuous improvement. Guided by the School Planning and Management Team, the Parent Team, and the Student and Staff Support Team, the leadership and operations of the school are distributed among a key set of stakeholders. Parents, teachers, students, and staff all have a voice and collectively take responsibility for decision making, reﬂection, ongoing data analysis, and course correction when necessary. Finally, through a spirit and expectation of collaboration, consensus decision making, and a no-fault approach to problem solving, the roof of the schoolhouse is in place. These guiding principles act as a cover, protecting the school from discouragement when setbacks occur. Even as the process of change brings tumultuous weather—driving rain, penetrating sun, and relentless wind—the adults who have committed to focused change will, over time and with an overarching belief in mutual respect and teamwork, persist despite challenges and barriers that will certainly arise. In this model, the school is viewed as a system whose purpose is to provide a supportive, warm, and caring climate within which relationships are nurtured and valued. In this way, the environment itself perpetuates a way of being that changes behavior, supports children's development, and facilitates deep and meaningful learning. From the beginning, [we had to] throw out the notion that we knew what children needed. We had to learn what schools were doing and look at outcomes and see whether they were meeting the developmental needs of children. We realized teachers and administrators at that time in the '60s and '70s weren't receiving preparation [related to] child and adolescent development principles. That's what we did—tried to create culture within school that allowed adults and caretakers to have some understanding of how development and academic learning were inextricably linked. [We] focus[ed] on how to create culture—ﬁgured that was critical—for everybody to keep focus on how children develop. The School Development Program operates from an understanding that just as child development is holistic and consists of many parts working together, the school system or ecology consists of many interrelated components that must work together to support children's development and learning. A strengths-based approach sees the potential at every level, from the child to adults and the broader milieu. Although schools cannot replace the family, they can recognize and draw out the positive health and social ingredients that are potentially and actively present in each family, cultural, and social setting (Cohen & Solnit, 1996). The use of data as a guide in a systematic evaluation process drives decisions about how to support children's development and learning. School teams come together to pore over school records on behavior, attendance, performance, and other matters to understand how children are developing along the six pathways and where intervention is needed. The framework also recognizes the centrality of teachers and teacher preparation in upholding and carrying out the framework. 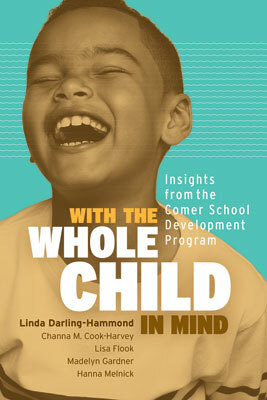 Comer's framework of child development is built on several truths about human behavior. Individuals need community and support to develop; behavior is a reaction to one's perceptions of the environment; thus, to change an individual's behavior, one must understand the individual's perceptions, attitudes, feelings, and abilities (Comer, Haynes, Joyner, & Ben-Avie, 1996). As adults in schools watch and listen to children more attentively, in light of what they are learning about child development, they are able to create new environments that are more supportive, positive, engaging, and child-centered. When this occurs, it stands to reason—and evidence shows—that development along the pathways improves as well. Each student has access to personalized learning and is supported by qualiﬁed, caring adults. A whole child approach seeks to address the distinctive strengths, needs, and interests of students as they engage in learning. It recognizes the importance of and interrelationships among all areas of development and designs school policies and practices to support them. These include access to nutritious food, health care, and social supports; access to strong relationships; educative and restorative disciplinary practices; and learning opportunities that are designed to activate and engage students, while supporting their motivation and self-conﬁdence to persevere and succeed. All aspects of children's being are supported in an effort to ensure that learning happens in deep, meaningful, and lasting ways. To achieve these goals, educators must understand how developmental processes unfold over time and interact in different contexts so that they can design supportive environments. Although development follows general trends, the processes of development unfold differently for each child, inﬂuenced by the interaction between unique aspects of the child and the child's family, community, and classroom contexts. As a result, schools must be designed to attend to the unique needs and trajectories of individual children as well as to support patterns of development, and educators must know how to differentiate instruction and supports to enable optimal growth in competence, conﬁdence, and motivation. The Comer School Development Program offers a model for "rallying the whole village" in the service of all aspects of student development and learning. It is built on decades of accumulated knowledge about how children grow and develop that has been reinforced by new research from the biological sciences and neurosciences, as well as the learning sciences. Development is malleable. Children learn new skills from birth through adulthood because the brain never stops growing and changing in response to experiences and relationships. The nature of these experiences and relationships matters greatly to the growth of the brain and the development of skills. The wiring of important neural circuits is enhanced by good nutrition; positive, affirming interactions and responses; experiences that support a sense of safety and trust that enables attachment; and experiences that allow for exploration of language and the physical world, with rich materials that allow children to inquire into the world around them. Development occurs within concentric circles of inﬂuence, beginning with the family and extending to the school, the community, and larger economic and social forces that inﬂuence children's development directly and indirectly. Human development is variable. The pace and proﬁle of each child's development is unique. Although development generally progresses in somewhat predictable stages, children begin at different starting points and learn and acquire skills at different rates and in different ways. This variability means that schools should avoid labeling children or designing learning experiences around a mythical average. When they try to force all children to ﬁt one sequence or pacing guide, they miss the opportunity to nurture the individual potential of every child, and they can cause children (as well as teachers) to adopt counterproductive views about themselves and their own learning potential that undermine progress. Rather than assuming all children will respond to the same teaching approaches equally well, teachers must differentiate and personalize supports and intervention for different children. Human relationships are the essential ingredient that catalyzes healthy development and learning. Supportive, responsive relationships with caring adults are the foundation for healthy development and learning. Brain architecture is developed by the presence of warm, consistent, attuned relationships; positive experiences; and positive perceptions of these experiences (Center on the Developing Child at Harvard University, 2016). For example, a mother's ability to accurately interpret and respond to her infant's cues affects the wiring of brain circuits that support later skills. The same wiring can occur when teachers and peers respond in supportive ways. When teachers are responsive and affirming, children's development and learning are enhanced. The role of relationships in childhood and adolescence also has an important protective effect. Research has found that when children have a stable relationship with at least one committed adult, this relationship can buffer the potentially negative effects of even serious adversity. Children beneﬁt when relationships are consistent, empathetic, responsive to their needs, and model productive social, emotional, and academic behaviors, thereby building developmentally appropriate skills. Adversity affects learning—and the way schools respond matters. Stress is a normal part of life, but excessive stress can throw learning and development off track and undermine children's well-being. School practices can either exacerbate or buffer the effects of childhood adversity. When threatened, humans activate a stress-response system, which includes a surge in hormones (cortisol and adrenaline) that make them focused, vigilant, and alert until it is appropriate to return to a calmer state. But prolonged stress caused by ongoing adversity damages the functioning of bodily organs and creates anxiety and depression, also interfering with executive functioning and memory. Traumatic events can occur both outside and inside schools. In schools where students encounter implicit bias and stereotyping or punitive discipline tactics rather than supports for handling adversity, their stress is doubled. Punitive school responses often include exclusion through suspensions and expulsions, which disproportionately affect low-income students of color and students with disabilities, who receive harsher penalties than other students who engage in similar behaviors (Cardichon & Darling-Hammond, 2017). However, schools, families, and communities can buffer the effects of stress by facilitating supportive adult-child relationships that extend over time; teaching and reinforcing social-emotional skills that help children handle adversity, such as the ability to calm emotions and manage responses; and creating strong, dependable, supportive routines for both managing classrooms and checking in on student needs (Center on the Developing Child at Harvard University, 2016). Learning is social, emotional, and academic. Emotions and social relationships affect learning. Positive relationships, including a trusting relationship with a teacher, and positive emotions, including interest and excitement, open up the mind to learning. Negative emotions, including fear of failure, anxiety, and self-doubt, reduce the capacity of the brain to process information and to learn. A child's best performance occurs under conditions of high support and low threat. In addition, children's abilities to manage their emotions inﬂuence learning. For example, learning to calm oneself and focus attention provide the foundation for learning, including the ability to persist with hard tasks and to pursue interests over a longer period of time. Students' interpersonal skills, including their ability to interact positively with peers and adults, to resolve conﬂicts, and to work in teams, all contribute to effective learning. Students' motivation and their "metacognitive skills," the ability to guide their own learning and understanding, also are important for effective learning. Students who have a growth mindset—that is, they believe they can improve through effort, trying new strategies, and seeking help— are less likely to become discouraged and more likely to try harder after encountering difficulties. They are more likely to tackle tasks at the edge of their current skillset than students who believe their intelligence is ﬁxed. This mindset translates into stronger performance in school and in other tasks in life as well. These skills, which help children modulate stress, develop more advanced skills, and productively engage in learning and in life, can be taught. Engagement and effort are supported in classrooms where children feel they are not typecast or stereotyped, where they see that they can improve with effort (for example, by revising their work), where they are respected and valued by their teachers and peers, and where they are working on things that matter to themselves and others. In order to provide our children and youth with a more "science-of-learning-and-development-aligned" education, what's needed most of all is a mindset that stops arguing that there are smart and dumb kids—good and bad kids. All kids are differently developed and underdeveloped. [Schools should be created so that] all of the people a child comes into contact with and structures and procedures are designed to support kids, so they can be successful in any situation, academic in particular, and so they can be successful in life. It is important that schools provide a positive learning environment that includes security and support that maximize students' ability to learn social and emotional skills as well as academic content. A positive school climate "is based on patterns of students', parents' and school personnel's experience of school life; it also reﬂects norms, goals, values, interpersonal relationships, teaching and learning practices, and organizational structures" (National School Climate Center, n.d.). The National School Climate Center outlines 13 dimensions that cover all aspects of the school environment, ranging from physical and emotional safety and the physical maintenance of the school building and grounds to relationships, engagement, and a sense of belonging. Many of these constructs can also be considered "conditions for learning," which enable the development of students' social and emotional skills. For example, students need social supports from adults and peers that make them feel connected to the school before they can develop optimism or a growth mindset. Similarly, students need to feel safe from verbal abuse and bullying in order to develop strong social awareness and relationship skills. A recent report reviewed 78 school-climate studies published since 2000 and found that a positive school climate can mitigate the negative effects of poverty on academic achievement (Berkowitz, Moore, Astor, & Benbenishty, 2016). The authors conclude that "a more positive school climate is related to improved academic achievement, beyond the expected level of achievement based on student and school socio-economic status backgrounds" (p. 34). The most important elements of school climate contributing to increased achievement were associated with teacher-student relationships, including aspects such as warmth, acceptance, and teacher support. School climate describes how students, teachers, and parents respond to school culture. Culture, in turn, refers to a school's set of norms, beliefs, and practices, and it is driven by the school's values and expectations that are "embedded in structures and practices and transmitted explicitly and implicitly" (Jones & Bouffard, 2012). Together, culture and climate set the tone at a school and can be seen in the physical environment, experienced during the learning process, and felt in how people within the school interact with one another (Melnick et al., 2017). As students and school personnel reﬁne their social and emotional competence, school climate improves; likewise, a positive school climate creates the atmosphere within which social and emotional learning can take place (Jennings & Greenberg, 2009). Often over the years people can't ﬁgure out [what caused the change in schools we worked in]. They know something good has happened because of attitudes and behaviors—but they can't ﬁgure out how it happened. In other settings, these same kids would be acting out in troublesome ways. A reporter [who] came and spent the week [at one of our schools] said, "This is a good school, but I don't know why." It's built into the structures and processes that create change in people—in their attitudes, beliefs, ways—that enable them to get along and support development of kids, rather than controlling kids through punishment, which sets up negative behaviors. We give kids knowledge, experience, and relationship skills that enable them to succeed in a school setting. [That approach] decreases and prevents behavior problems and increases their desire to perform and be successful. But you can miss the effect or impact of structures and processes if you don't understand how they all come together to create culture. Many educators have noted that the policy climate during the No Child Left Behind era created disincentives to taking this broader context into account. Instead, the focus of schooling largely shifted to sanctions and punishments, competition and comparison, as these were attached to test scores that were expected to climb higher year after year. Schools with low scores—often those serving high proportions of students of color and those living in poverty—could be placed in mandated interventions, often without the necessary resources to achieve different results, or they could be reconstituted or closed. Accountability policies created incentives for schools to push out their most academically and socially challenging students so as to boost scores, placing their most marginalized students at even more risk (Wald & Losen, 2003). Zero-tolerance discipline policies pushed many out, while a narrowed, test-prep curriculum that focused on low-quality tests caused others to disengage (Ladd, 2001). Labeling schools serving high-needs students as failing, and instituting sanctions against them, also caused well-qualiﬁed educators to ﬂee these schools, leaving the students, quite often, with a revolving door of underprepared, overwhelmed novice teachers even less able to create a stable, caring, engaging learning environment. We made a strategic point of focusing on the idea that it's development that supports learning, and not the other way around. This was right around the time when people were starting to get very much focused on high-stakes testing; so people felt, OK, well, if the kid gets high scores and does well, then he'll do better. And what we said very simply is that you've got to be concerned with all the areas of development because they're all connected. What we felt very strongly is that our goal as the adults is try to ﬁgure out as many ways as we could to assure that youngsters were successful in school. … So we had to make sure that we were attuned to the physical development of kids, the linguistic development, the social, emotional, psychological. We understood that all of these things were related to cognitive development, and if youngsters are not doing well academically and your only focus is on academics, then you spend most of your time chasing a score. We never felt that was an education. I think when you're not only trying to service that cognitive slice, when your intention is to make sure that we're balancing with the other developmental pathways, it's a different way of offering information to the kids. … The intention to hold space for them to grow as a whole child is completely different than the intention of getting their brain to be able to function to accept all this information and then to be able to spit it out in a way that's not developmentally appropriate. Mayrick went on to explain how using the lens of the developmental pathways in turn had an impact on all aspects of the school environment and the discourse surrounding the work of teaching and learning: "It changed our conversation; it changed how we talked about the students; it even changed sometimes how we looked at ourselves." Behave collaboratively, modeling productive problem solving. Demonstrate ﬂexibility and expertise in change management. Relate knowledge of child and youth development to student learning. This approach allows teachers to see students' potential, encourage their imagination, and recognize special gifts that the children and their families may not yet be aware of. This hopefulness can become internalized by students when there is mutual trust and ongoing opportunity for meaningful teaching and learning. As children are socialized in a caring school community, they develop increasing capacity to act as effective agents of change (Cohen & Solnit, 1996). The Comer Process has an intentionality that lends itself to satisfying and lasting change. Unlike other reforms that have faded as people grew weary and slowly stopped implementation, or those reforms that lived solely within the vision of one leader, implementing the Comer Process means changing the lifeblood of the school itself—transforming the environment, the knowledge base of and interactions among adults and children, and the mode of operation—so much so that reverting to old habits is very difficult. The SDP encourages a "knowledge adoption" mindset rather than a "program adoption" mindset. The aim is to infuse developmental knowledge into education with structures that provide a means to do so. Ultimately, the work is about promoting the development of children, training and supporting adults so that they can support students, and designing schools so that they can support adults and children. A productive school grounded in an understanding of the science of learning and development keeps students in school and promotes academic results by way of meaningful, deep learning, and helps students acquire the social-emotional skills, habits, and mindsets necessary to be successful in school and in life beyond school. In a sense, the SDP school is a training academy for the rest of life. When an SDP school is working well, it is a model of a just society (Comer et al., 2004). The conditions of the school can be created to bring out that which is good, helpful, and supportive in each person. 1 This section draws in part on Melnick, Cook-Harvey, & Darling-Hammond, 2017.